A new astrological year has begun with bold cardinal energy. In Finland a heavy snow cover is melting. Due to climate change cold winters are becoming increasingly rare here in Southern Finland, but during the past winter we got more snow than in decades. Easter is approaching, and we are welcoming the spring. 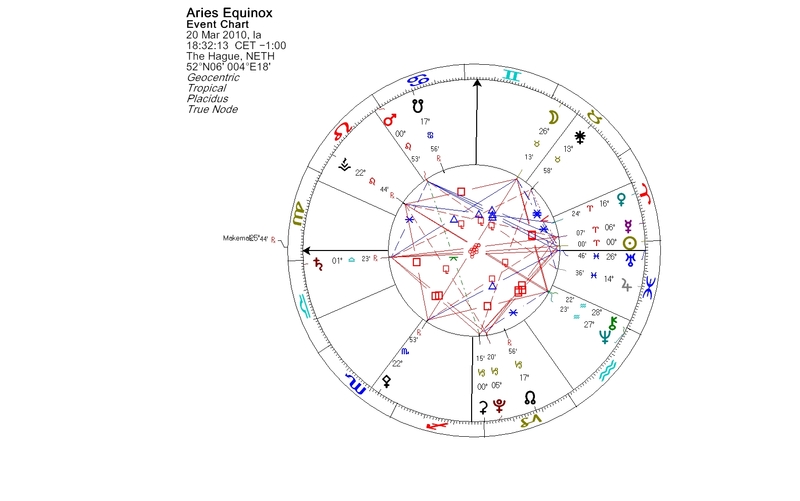 The Sun entered Aries on March 20 and formed a cardinal T-cross with the retrograding Saturn in Libra, and Ceres-Pluto conjunction in early Capricorn. The ruling planet of Aries, Mars, turned in direct motion already before the equinox. The Libra Full Moon is in conjunction with Saturn. The cardinal point action continues. The Pisces New Moon earlier in the month was tightly conjunct Mercury and Uranus. The creatively sparking conjunction was in exact opposition to one of the new planets, Makemake. The Uranus-Makemake opposition in Virgo-Pisces is one of the long time transits of the current era. These two planets form a series of oppositions between April 2009 and January 2011. The Virgo-Pisces sign polarity deals with being in service to others. 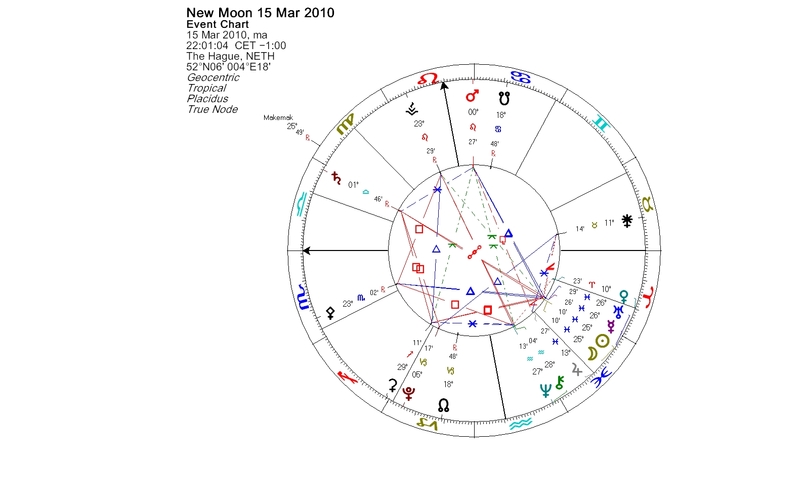 After the Pisces New Moon the Sun moved on opposite Saturn, thus giving us an opportunity to stabilize what was started at the time of the new moon. The Uranus-Makemake opposition still holds. Makemake is a bright Kuiper belt object covered with almost pure methane ice. It is the third-largest known dwarf planet in our Solar System after Eris and Pluto. Its orbital period is nearly 310 years. The body was discovered five years ago, and the discovery team nicknamed it as Easterbunny, because of its discovery near Easter. The permanent name of Makemake after the creator god of the native people of Easter Island was chosen in part to preserve this connection. The official naming took place in July 2008 at the time when Uranus and Makemake had reached a near exact opposition. Makemake in the Rapa Nui mythology of Easter Island, was the creator of humanity, the god of fertility and the chief god of a birdman cult. The cult ritual was a dangerous competition. The contestants raced to collect the first egg of a seabird from an islet near by. They had to swim in waters which were heavily populated with sharks, then climb sharp cliffs with the egg. The winner became the birdman and spent the next year in seclusion. His clan got sole rights to collect that season’s harvest of wild bird eggs and fledglings from the islet. Makemake the dwarf planet was discovered at 20+ degrees of Virgo. The Sabian Symbol for Virgo 21 is A girl’s basketball team. Dr. Marc Edmund Jones has delineated the symbol: “…The self cannot exist in a vacuum, and there is no satisfaction in any effort expanded for ends in which others are not vitally concerned. Man’s fulfillment is primarily a continued participation in common goals, with rewards to which his fellows contribute as consistently as himself. The keyword is expression.�? Lets take a look at what was happening in the world during the last major Uranus-Makemake transits. The first Uranus-Makemake opposition in the current series of five occurred on April 12, 2009. It was the day when the Maersk-Alabama hijacking ended and Capt. Richard Phillips was freed. In the series of events involving the pirate seizure, the captain had offered himself as a hostage to save his crew. The latest square between Uranus and Makemake took place in 1980, which was also the year when Lech Walesa at a Polish shipyard founded Solidarity, the first independent labor union in a Soviet-bloc country. Solidarity gave rise to a broad anti-communist nonviolent social movement and contributed to the fall of communism. Uranus conjoined Makemake in 1955. Year 1955 marks the beginning of the African-American Civil Rights Movement. During the period 1955–1968, nonviolent protests and civil disobedience produced crisis situations between activists and authorities. In December 1955, Rosa Parks refused to give up her seat on a public bus to make room for a white passenger. There had been similar incidents before, but Rosa Parks’s action led to Montgomery Bus Boycott, and she became the icon of resistance to racial segregation. These examples seem to point to events where courageous individuals have stood up for the common good of their community. Two more exact Uranus-Makemake oppositions are ahead (in October 2010 and January 2011) and we can expect to learn more about Easterbunny. 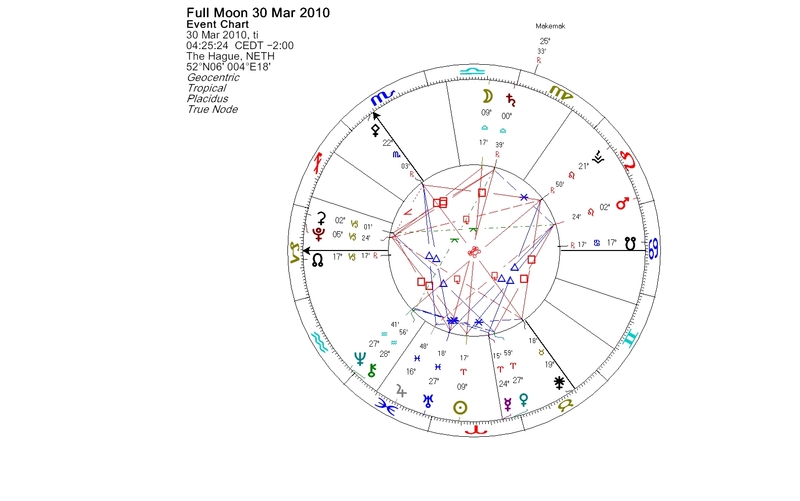 This entry was posted on Wednesday, March 31st, 2010 at 8:03 pm	and is filed under Equinoxes, Full Moon, New Moon. You can follow any responses to this entry through the RSS 2.0 feed. You can leave a response, or trackback from your own site.